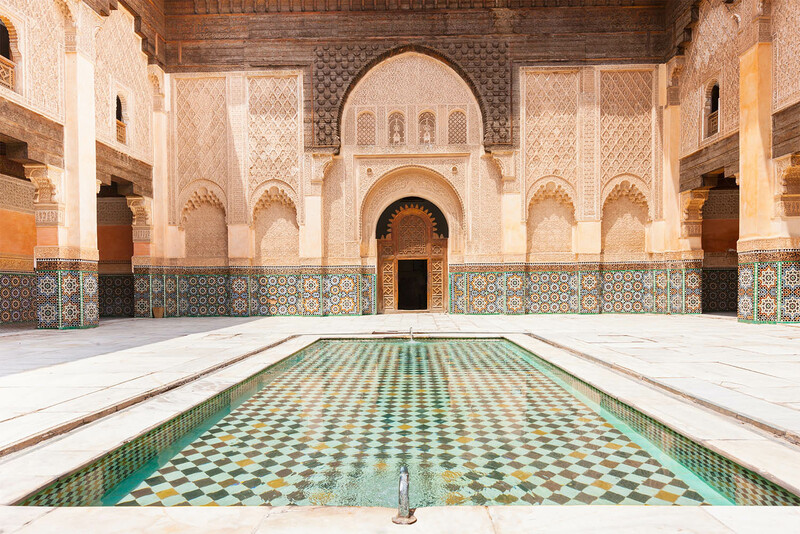 Colourful architecture, medieval souks, winding alleyways, snake charmers… Morocco’s most enchanting city is like something from a storybook. 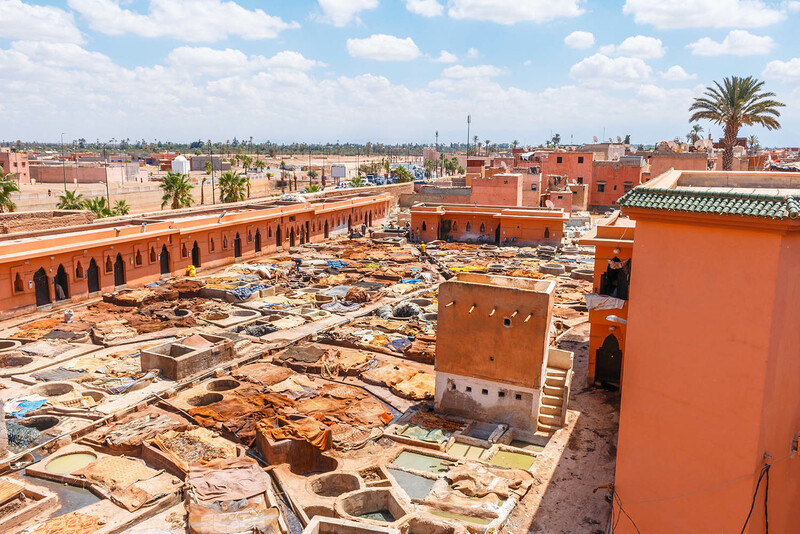 Known as The Red City due to the 13th-century reddish clay ramparts that encircle its medina, Marrakech is one of the most fascinating cities in the world. The city centre is just 10 kilometres from Marrakech Manara Airport; most hotels will offer a transfer service. If not, a taxi will take around 15 minutes and should cost around $15, but make sure the meter is on! The city is divided into the medina (old town) and Gueliz (new town). There are two types of taxis: grand taxis are usually old Mercedes that can carry up to six people and can head outside of the city limits, whereas petit taxis are – as the name suggests – smaller and stick within the city limits. The medina is the city’s soul and where most sites are located. It’s easily explored by foot – you can walk from one end to the other in about 15 minutes. It’s not unusual to get a little lost in the maze of alleyways, which are an endless hum of activity with people, donkey carts and street peddlers. In fact, getting lost is part of the fun! A fun way to explore the outskirts of the old city’s ramparts and the new town is by a caleche (a horse-drawn cart). A 30-minute to one-hour journey usually costs around $17–28. It took French painter Jacques Majorelle almost 40 years to create this exquisite garden, which he filled with exotic plants from five continents. He opened it to the public in 1947 to help offset some of the maintenance costs but after his death in 1962 the garden sadly fell into disrepair and faced hotel development. Yves Saint Laurent and his partner Pierre Berg bought the exquisite villa and garden in 1980 and restored it to the vision of Majorelle. The property has a vibrant electric blue Moorish–Art Deco studio that houses a Berber art museum, and a memorial to Saint Laurent whose ashes were scattered here. $10 entry for the gardens plus $4 entry for museum. Only rediscovered in 1917, the mausoleum of Saadian Sultan Ahmed al-Mansour ed-Dahbi is a sight to behold. Home to around 200 tombs of members of the Saadian dynasty, this 16th-century burial ground is decorated in imported Italian Carrara marble, intricate plasterwork, pure gold and colourful mosaics. Be sure to check out his mother’s mausoleum in the courtyard, which is guarded by stray cats. 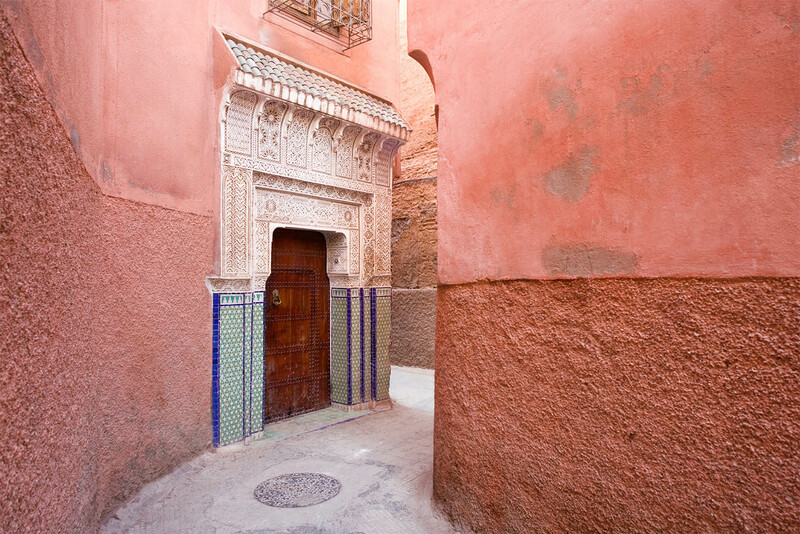 Entry is via a passageway in the Kasbah. Set within a riad in the winding alleys of the medina, this photographic museum is a lovely way to learn about the history of Morocco with its impressive collection of historical images taken by well-known and unknown photographers alike. Jemaa el-Fna Square, inside the medina, was once the place where Berber tribes traded slaves, gold, ivory and leather. Now you’ll find snake charmers, medicine men, musicians, entertainers, fortune tellers, and stalls selling juice and snacks such as dates, figs, almonds. Just north of this buzzy place is a labyrinth of souks which wind all the way to Musee de Marrakech. 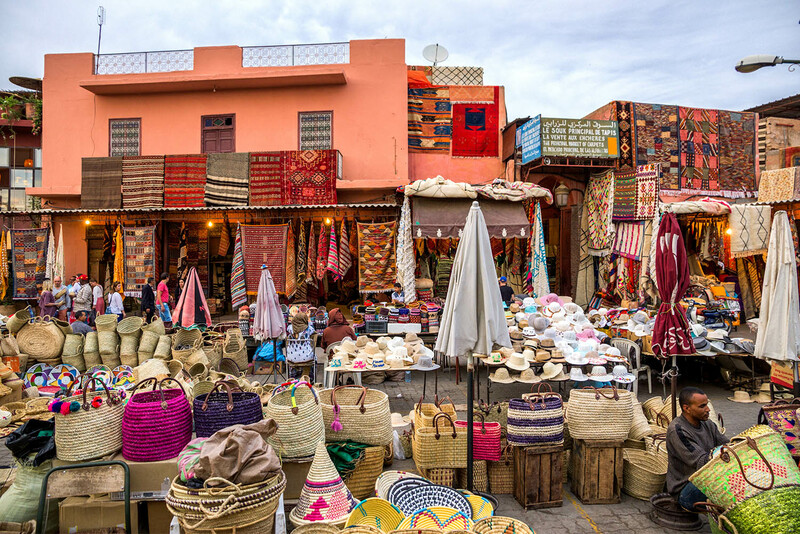 Each souk is named for the wares sold there, and you’ll find everything from carpets to silverware and antiques to leather… Make sure you barter! Also be sure to look out for Mustapha Blaoui, the real-life Aladdin’s Cave with a cornucopia of lanterns, rugs, shawls, furniture. It’s a one-stop shop for giving your home an exotic riad makeover. If haggling is a hassle for you, head to the new town of Gueliz, home to a collection of fixed-price boutiques. 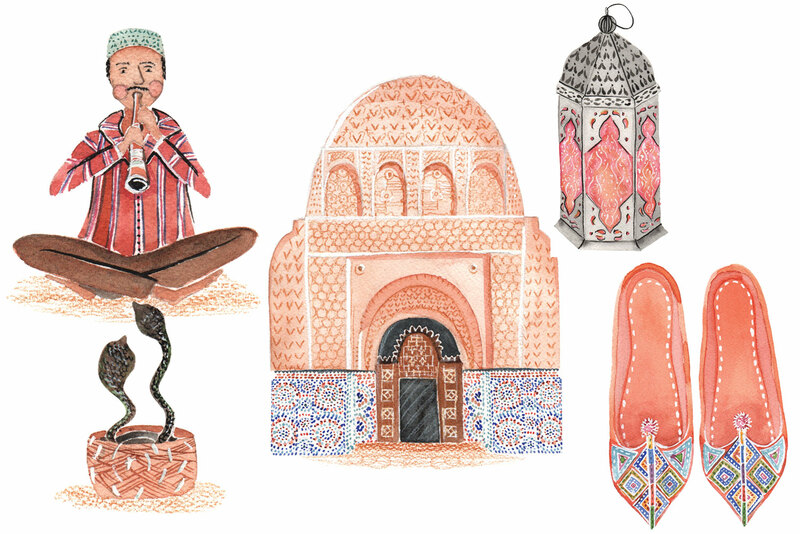 Stop by 33 rue Majorelle, which stocks stylish pieces from contemporary Moroccan and North African designers, ranging from jewellery to fashion to homewares; Place Vendome for leather goods; Atika for leather shoes; and Moor for traditional Moroccan embroidery. This leafy green oasis is housed in a 17th-century building down an alleyway in the medina. Built around a central courtyard, the cafe has a casual menu featuring traditional Moroccan and organic dishes with a European twist. Le Jardin’s sister restaurant is also located in the medina and has a fabulous rooftop terrace overlooking the spice souk – the spot to have a sundowner. The menu is modern Moroccan cuisine, with delicious dishes made up of local produce and spices. This Marrakech institution is the perfect spot for a special occasion. The menu is a sophisticated five-course degustation of modern Moroccan cuisine. There are several exotic dining areas: by the pool, on the rooftop, in a softly lit room strewn with cushions and on the terrace with brilliant views of the medina. If you’ve ever fancied tasting a camel burger, this casual café is the place to come. Enjoy live music and entertainment as you dine, or join one of the workshops where you can learn Moroccan cooking, calligraphy and henna. Owned by Sir Richard’s sister, Vanessa Branson, this boutique hotel located within the medina has 28 individually styled rooms and suites, and exudes a luxurious but laidback vibe. There’s three swimming pools, two of which are lined in Cararra marble, a rooftop terrace with a wonderful Moroccan–European restaurant, a calming spa, and art lovers will appreciate the impressive works that grace the walls here. Set among an old olive grove on the outskirts of the city is this gorgeous hand-built boutique hotel comprising three pavilions. The interior design is a stunning mix of authentic Moroccan with chic modern pieces. And, better still, 10 per cent of profits from staying here are given to community initiative Project Soar, which supports underprivileged women. Just a stone’s throw from Jemaa el-Fna Square, this luxurious hotel first opened in 1923 and is one of the city’s most legendary places to stay with Winston Churchill once claiming it to be “the most beautiful place on Earth”. Set on eight hectares of parkland, the hotel was restored to its former glory by Parisian designer Jacques Garcia and reopened in 2009 resplendent in traditional Arab–Andalusian architecture. Sitting just outside the medina’s walls, the Amanjena resort (part of the luxurious Aman group) is a tranquil oasis, built around a bassin and dotted with palms and olive trees, trickling fountains, reflective pools and garden courtyards. This palatial resort has 32 pavilions and six two-storey maisons, several with private heated pools, two elegant dining venues and a spa with two hammams which reopened in October 2015 after restoration. Too expensive! = Rally bizef!